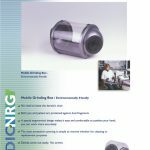 Welcome to MedicNRG's site of innovations! 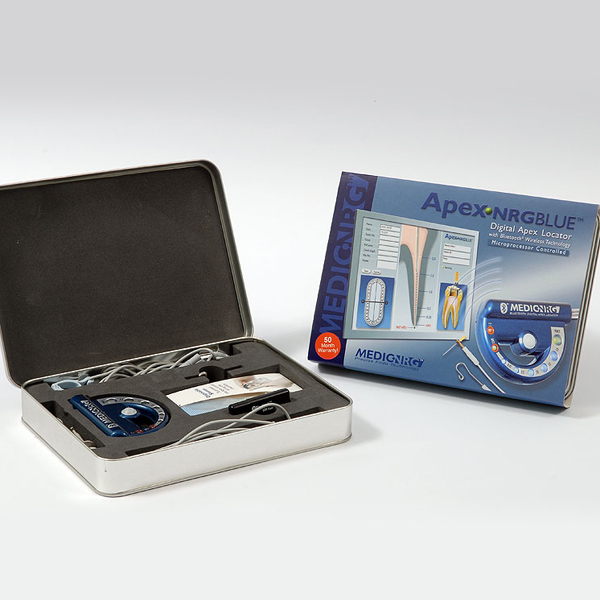 MedicNRG is a leading company in the global Endo technology field, and a major manufacturer of Electronic Apex Locators (EAL) . 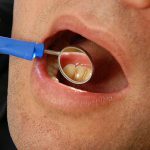 We are unique in our the capability to exactly define a need, “know how” in dental and technological fields and an advanced marketing perception. 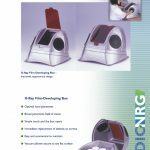 We aim to integrate design and user friendly interfaces as essential components of our devices’ identities, creating excellent tools in hands of dentists and advancing healthy dentistry.... MedicNRG is a leading company in the global Endo technology field, and a major manufacturer of Electronic Apex Locators (EAL) . 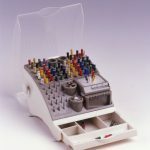 We are unique in our the capability to exactly define a need, “know how” in dental and technological fields and an advanced marketing perception. 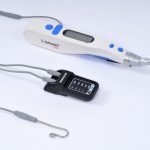 We aim to integrate design and user friendly interfaces as essential components of our devices’ identities, creating excellent tools in hands of dentists and advancing healthy dentistry. 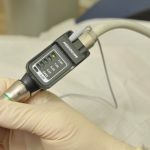 Two Israeli dentists, through regularly performing Endo procedures, recognized the need for more sufficient technical solutions to facilitate their work environment. 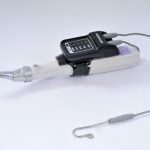 As doctors who performed many root canal treatments, they searched for a reliable device for accurate identification of the biological apex. 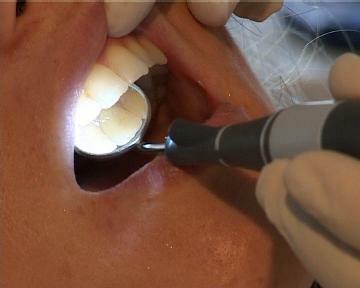 The instability of the existing devices made the exact location of the file inside the root canal an uncertainty. This ambiguity caused anxiety regarding the possible damage incurred to the apical tissue. 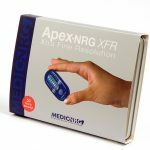 At this point, MedicNRG directed its dynamic energies to the development of an innovative apex locator, based on the cutting edge technology of Digital Signal Processing (DSP). 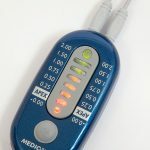 An emphasis was placed on the design and the user friendly interface, miniaturization, and technology that when synergized create an accurate apex locator which every dentist can work with and rely upon absolutely. 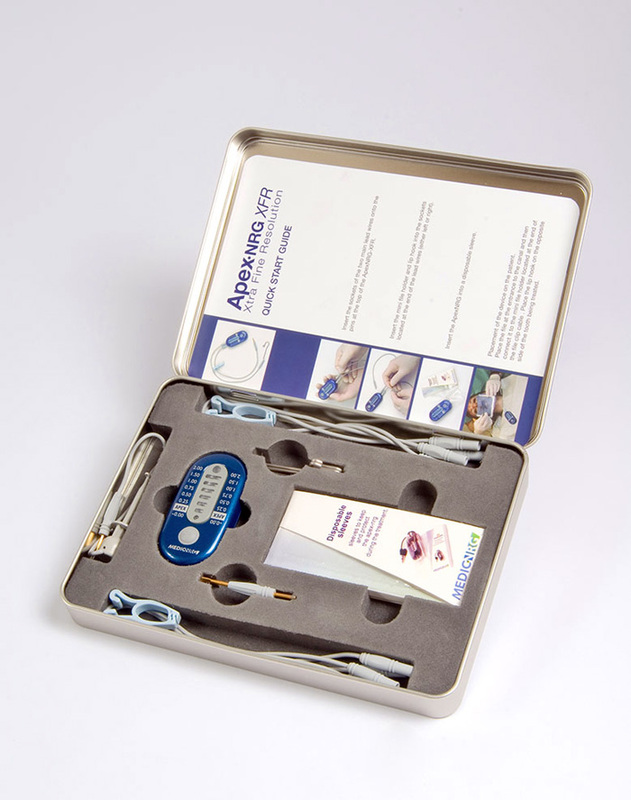 This is how the first Digital Apex Locator was born. So what is our story? 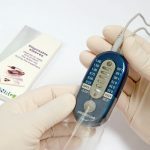 The capability to exactly define a need, know-how in the dental field and an advanced marketing perception that integrate the design and the user friendly interface as essential components in the device’s identity, allowing the endowment of unique solutions to our varied customers. 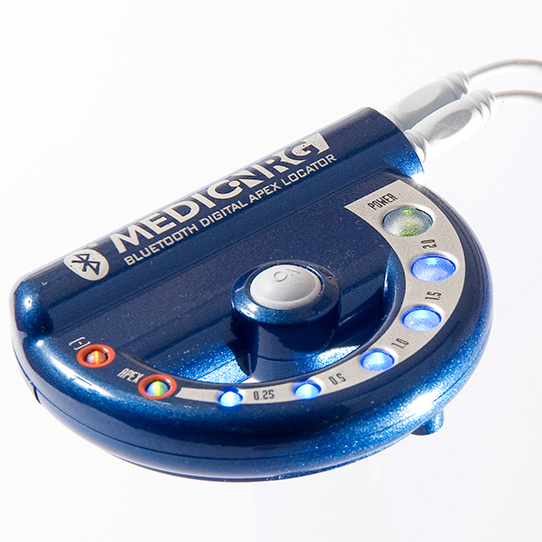 MedicNRG was established in 2000, by two dentists along with an industrial designer. 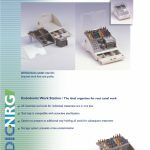 Today MedicNRG employs the leading specialists in the Endo field within the dental industry, in addition to engineers in bio-technology, electronics and mechanics and has diverse technical capabilities in various industrial aspects. 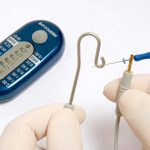 This enables us to develop, introduce and implement our innovative ideas beginning from the computer screen to the production line in abbreviated periods of time..
MedicNRG specializes in Endo oriented products, with our main devices being Digital Electronic Apex Locators (EAL). 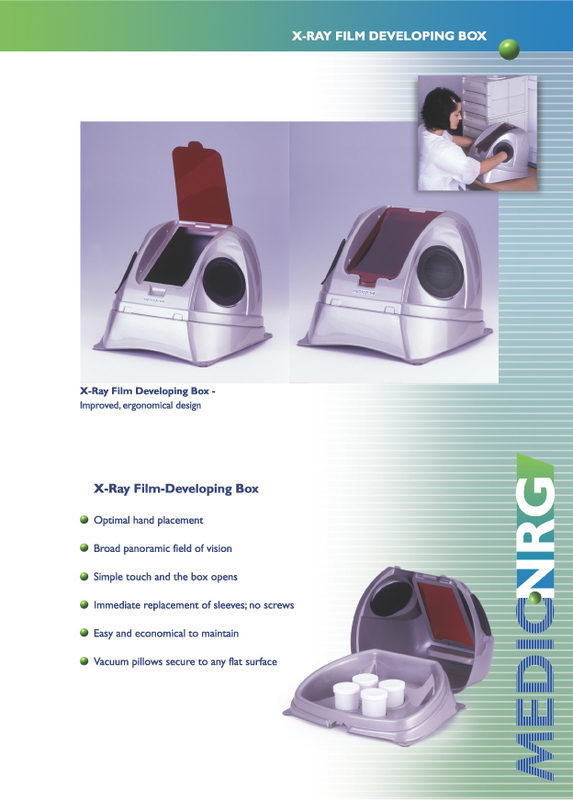 In addition, we are pleased to offer you a wide range of innovations for your dental clinic. 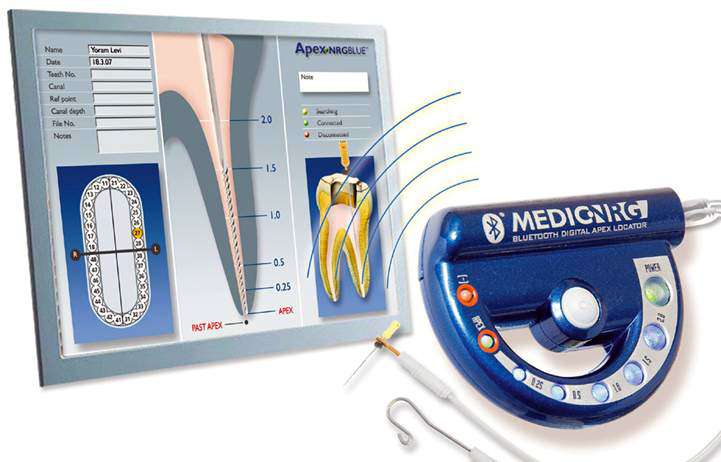 Brochur evaluation-01 evaluation-02 evaluation-03 evaluation-04 Operating evaluation-03 evaluation-04 Operating Manual Presentaion Brochur Digital Apex Locator designed to work with endodontic handpieces with Real-Time measurements at 0.1 mm precision. 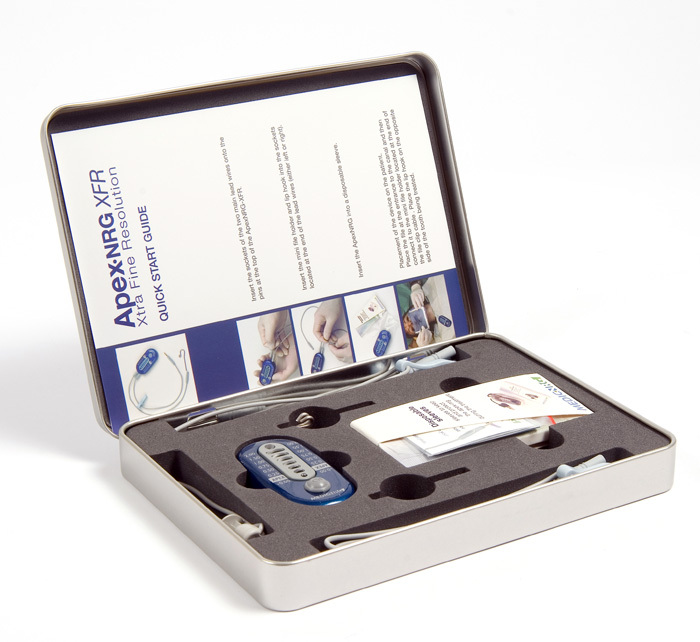 Using the ApexNRG-Rider S2 with digital technology, a maximal indication of the file location is displayed, with a measuring tolerance of 0.1 mm. The root canal is optimally cleaned right up to the apical constriction, without any fear of perforation of the periapical tissue. 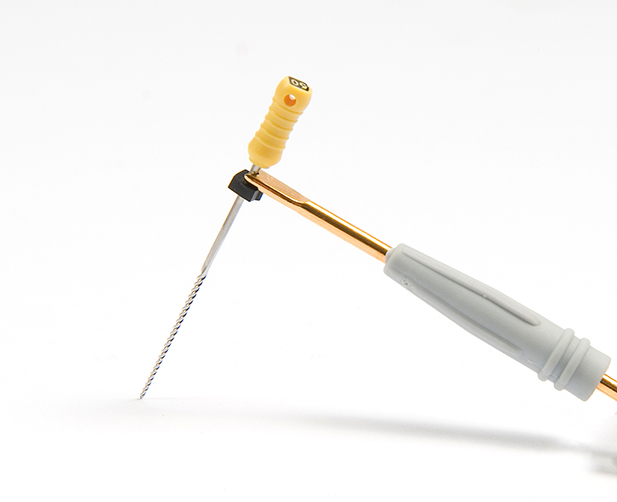 Riding- attached to your endodontic handpiece. 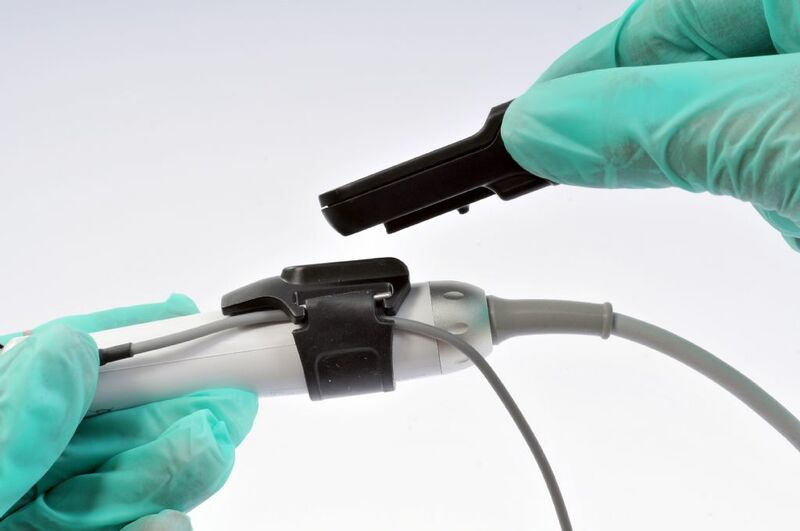 Satellite- connected to your handpiece by a cable, without being mounted on the handpiece. 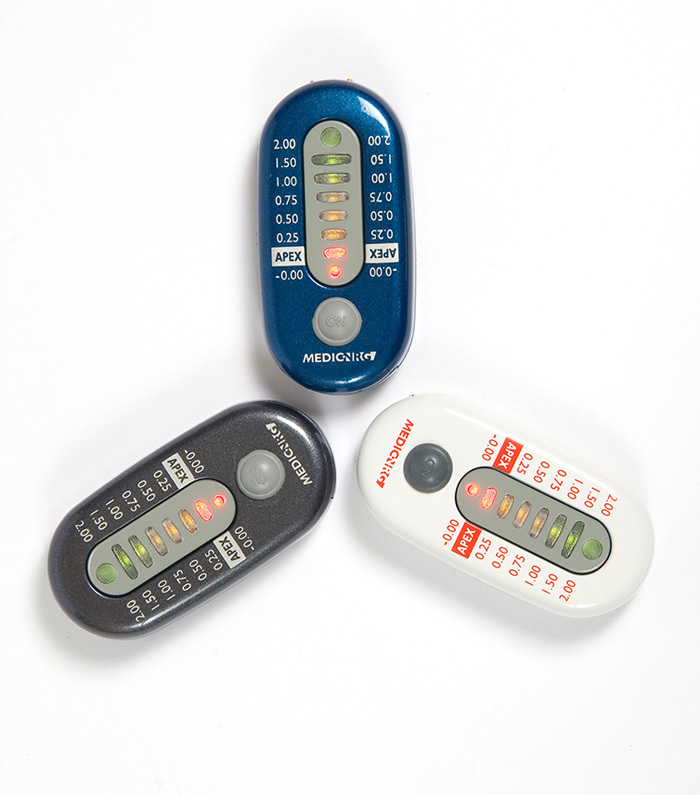 Stand Alone- disconnected from the handpiece and used as a standard, independent apex locator. 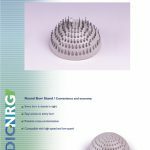 The Rider shortens the procedure time, thereby reducing costs, as the last NiTi shaping file can safely and confidently be used to the apical constriction. 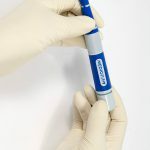 The Rider S2 is the only apex locator that is designed to work with most micro-motors to measure canal length while used with a handpiece or used manually. 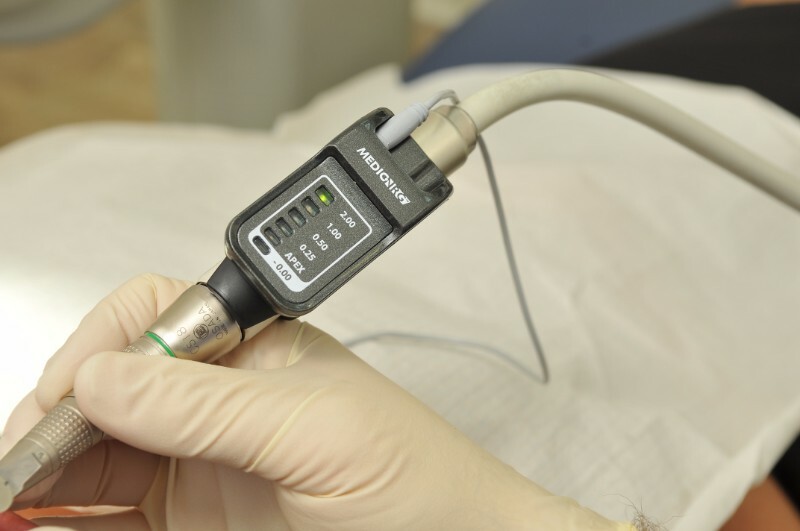 Precision & Accuracy For the first time, handpiece users can achieve an accurate, on-line reading in real time, without delay. Accuracy to 0.1mm in the apical region. 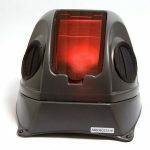 Sensitivity Each minute movement of the file is read and displayed on-line. 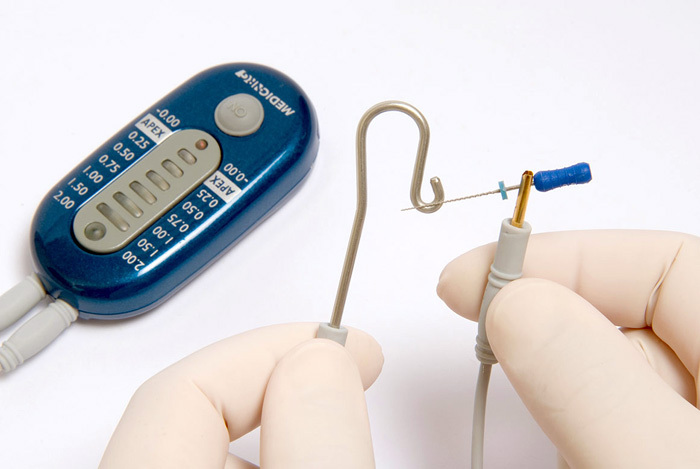 Safety & Confidence Security and peace-of-mind while performing the entire endo procedure. 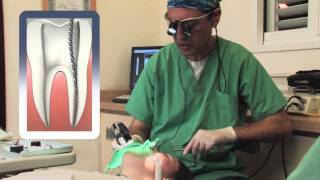 Optimization & Accomplishment Uniform and optimal canal preparation all the way to the apical constriction (0.0 mm) with the final shaping file. 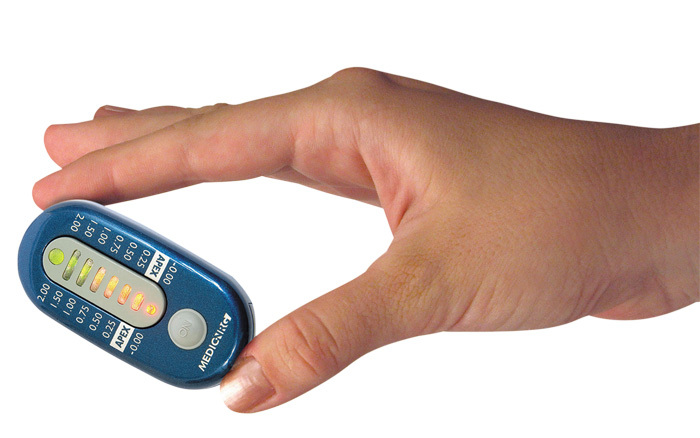 Time Saving & Cost Reducing The Rider shortens the procedure time, thereby reducing costs. 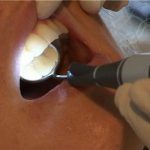 There is no need to finish the canal preparation with a manual file, as the last NiTi shaping file can safely be used to the apical constriction. 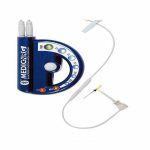 Convenient & Straightforward Easy to use, lightweight at 26 grams, display angle can be adjusted to the practitioner’s line of view. 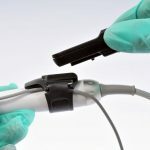 Flexible Configuration Three modes of use for full compatibility with the practitioner’s work habits; “Riding” the handpiece, connected by cable to the contra-angle (disassembled), or manual measurement mode. Certainty Of the file location in the canal, on-line, throughout the process. 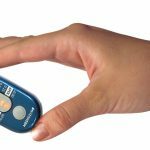 Easy access to patient history: The first electronic apex locator to implement Bluetooth Wireless Technology for the transmission, display and storage of measurement data on your clinic computer. 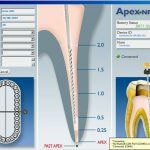 Take advantage of the built-in computerized measurement history database. 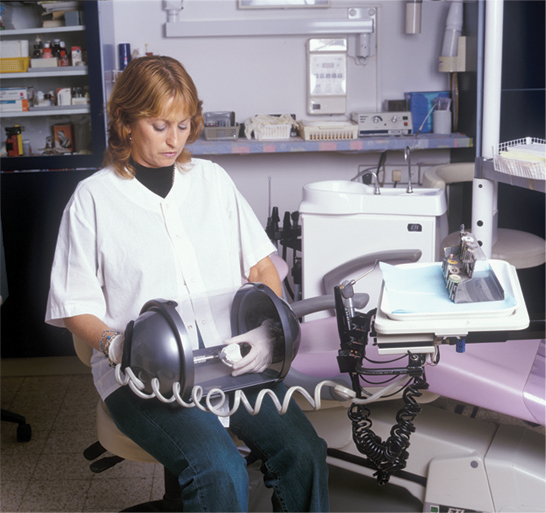 Monitor old measurements for comparison and better control of future treatments. 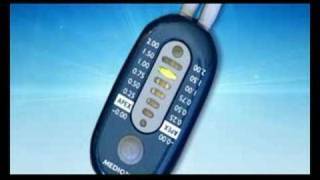 Measurement data can be saved in the patient’s file. No more handwritten records. 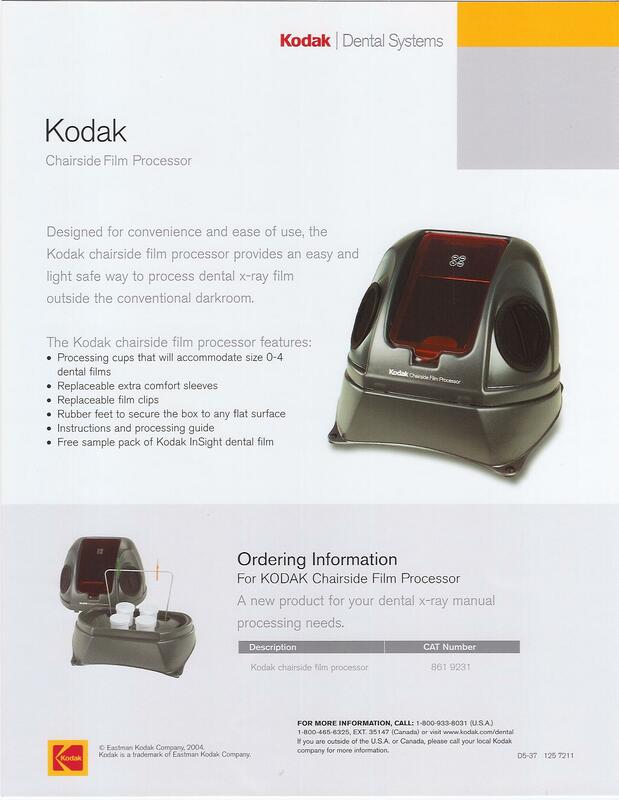 The measurement procedure is transferred to your computer via Bluetooth Wireless Technology. 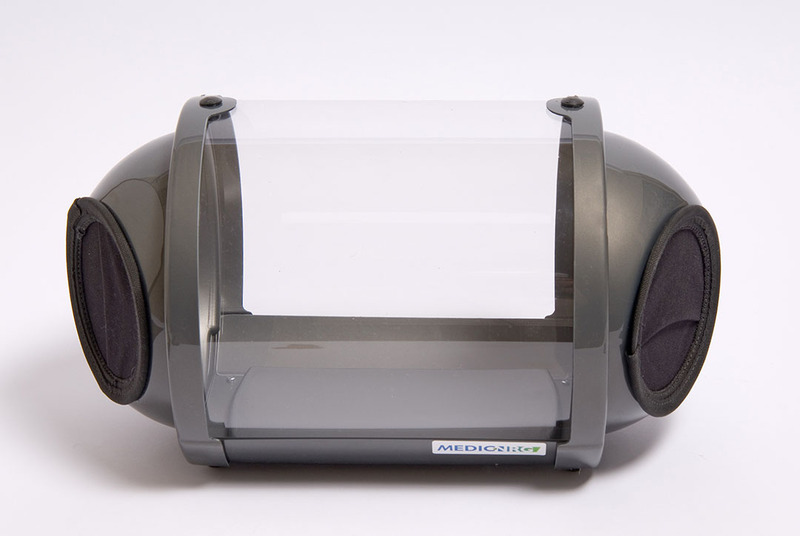 View the results on-line simultaneously on both the user-friendly display on the apex locator and any screen connected to a computer (PC, digital X-ray screen). 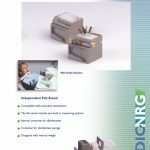 MedicNRG’s software is designed to be integrated with either or both digital x-ray and clinic management software already existing in the dental clinic to complement the paperless endo clinic objective. 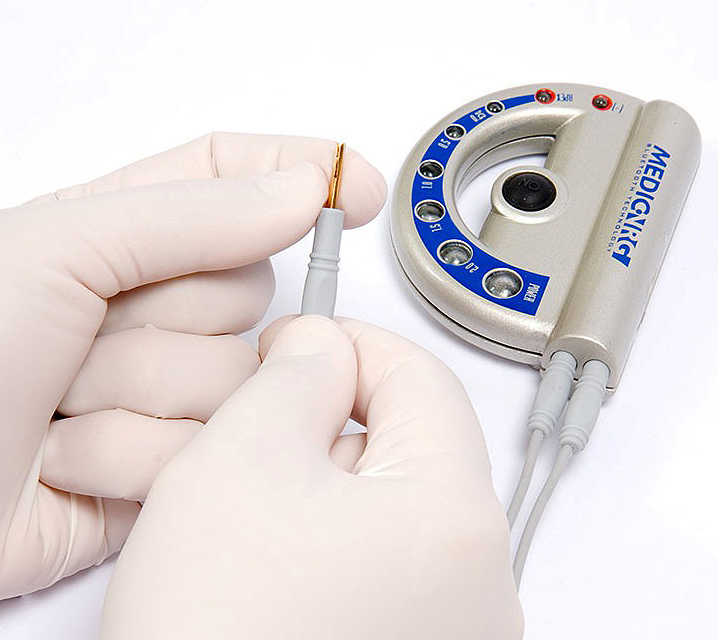 The file’s progress is marked by 8 LEDs giving maximum control of the procedure, displayed simultaneously on the device and the screen of your choice. 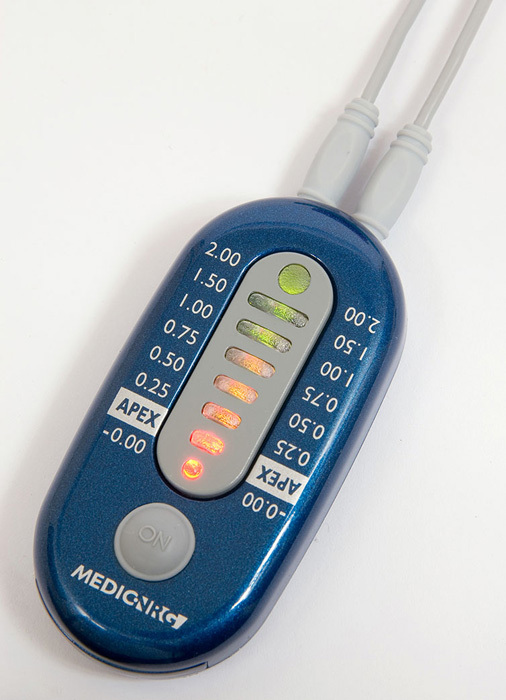 Unique automatic adjustment of the measuring current ensures accurate location of the biological apex in changing canal conditions, including dry, wet and bleeding canals. 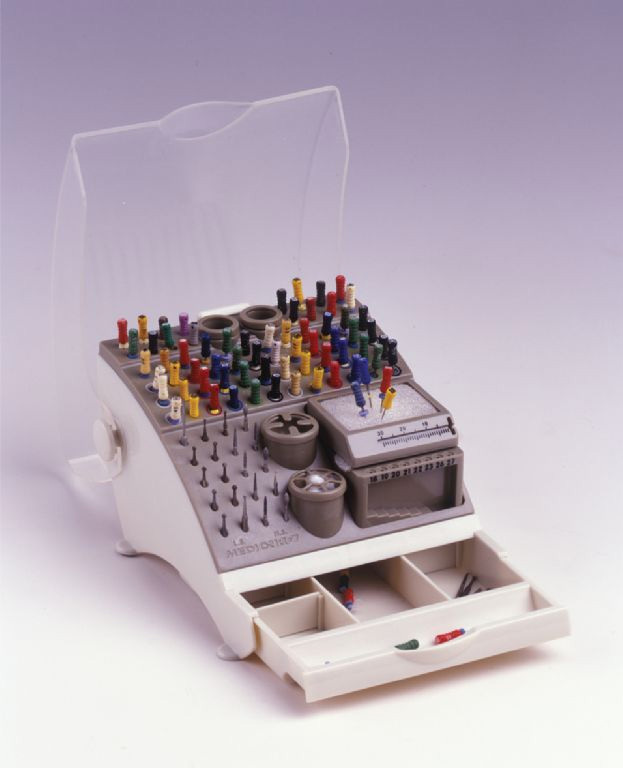 Calibration is automatic, no manual calibration is required. 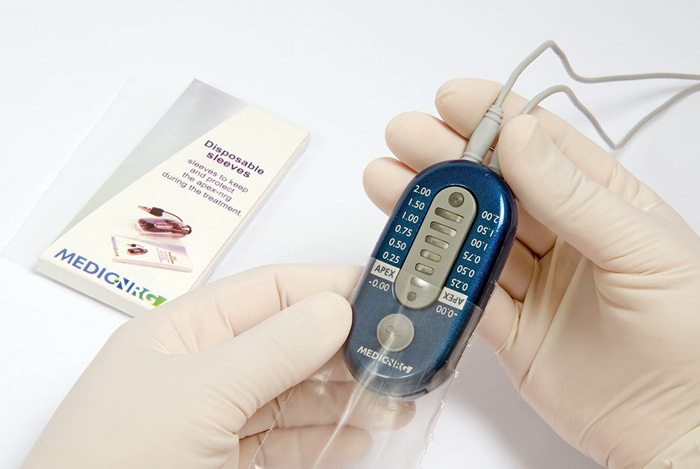 Audible alarm starting at 0.5 mm, changing pitch and frequency as the file approaches the apical constriction. 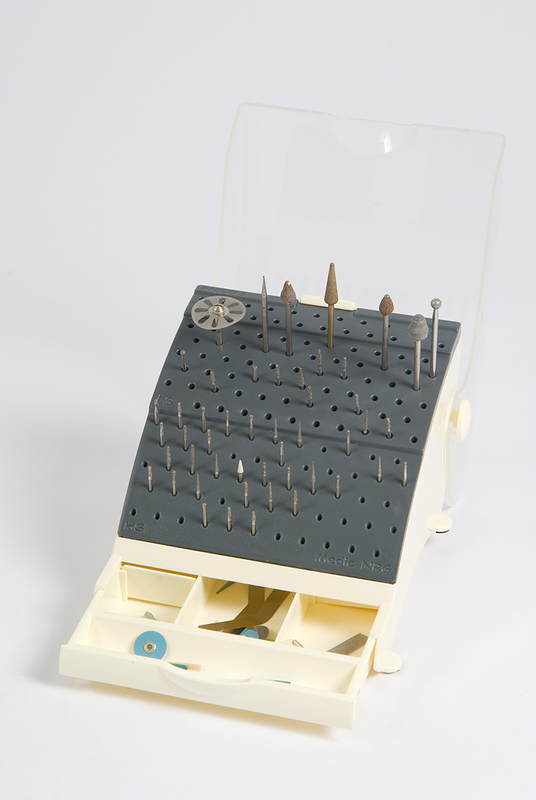 This allows you to keep your eyes on the patient and the procedure. There is no need to keep looking at the device. This compact instrument (50 grams) is easy to store and easy to manipulate during treatments. 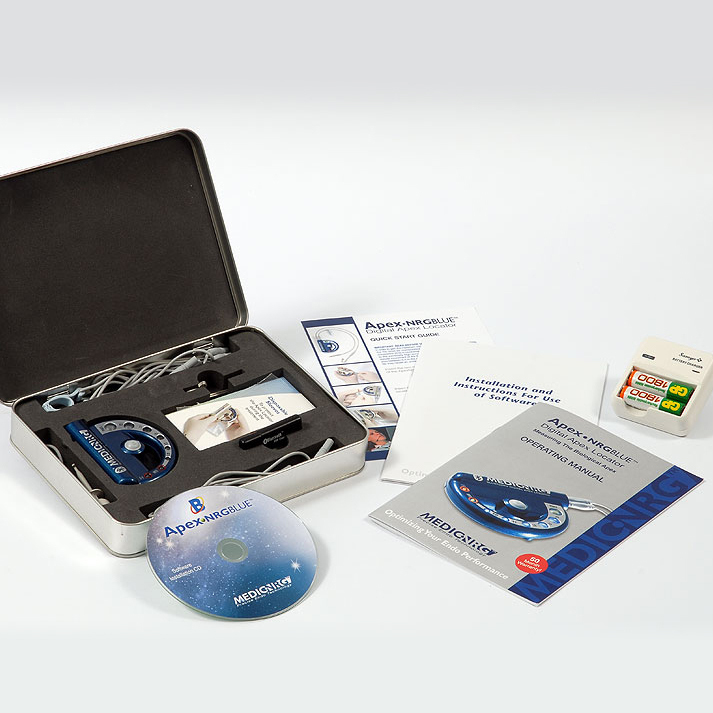 Placement near patient’s mouth, within your line of vision, allowing you to easily and comfortably follow the progress of the file on-line. 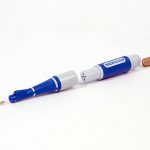 Short cables prevent external EMI distortions that can occur in weak and sensitive signals that are typical of long cables. 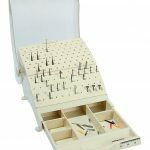 Fully autoclavable accessories including a double set of cables, lip hooks, apron clasps, as well as a sensor probe and exclusive mini file holders. 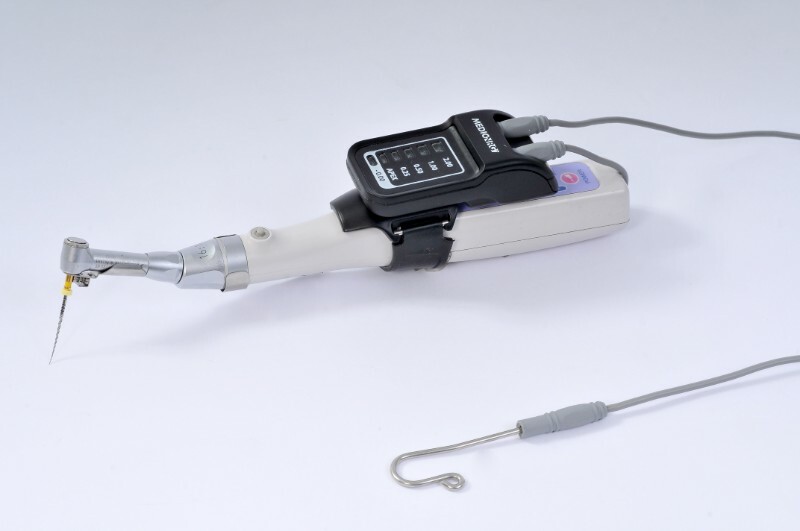 The device can be turned on by simply touching the file to the lip hook – no need to press the ‘ON” button. Automatic shut-off. Easily replaceable, rechargeable battery, supplied with a charger. 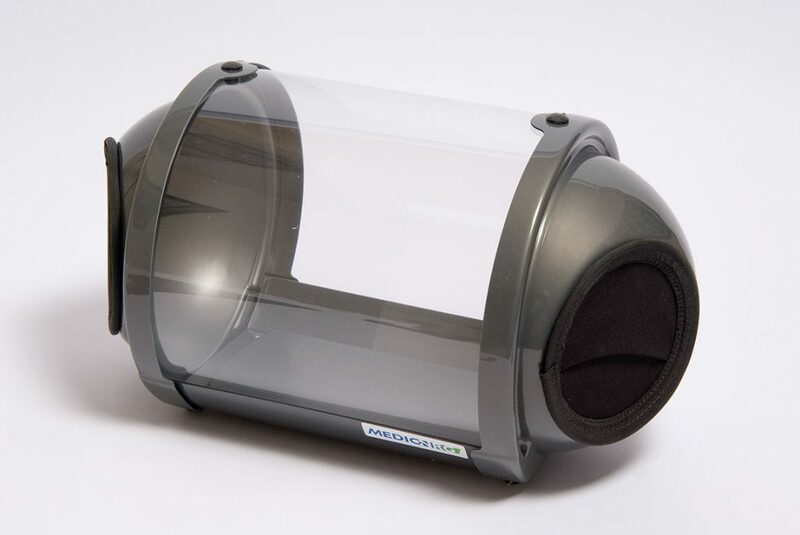 Guarantee: The only apex locator in the world with a full 50 month manufacturer’s warranty. Xtra Fine Resolution for maximum control of the procedure. 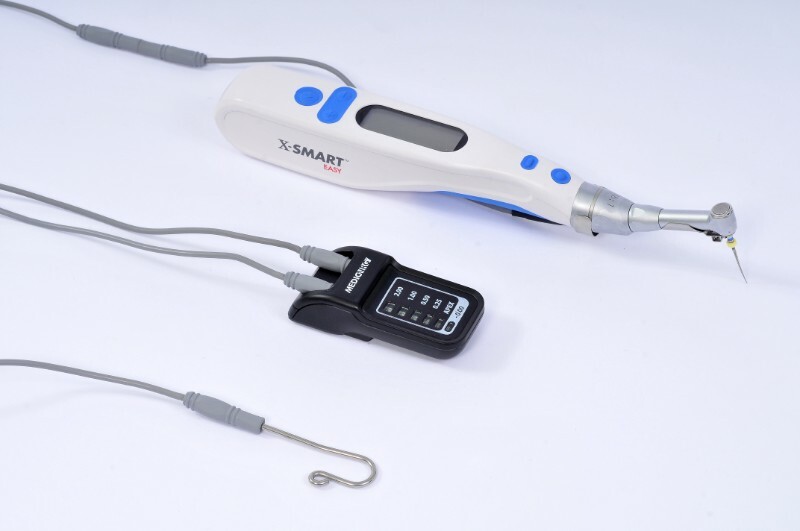 The file’s progress is marked by 8 LEDs distributed every 0.25 millimeter, showing the length of the root canal clearly and directly on the user friendly display. 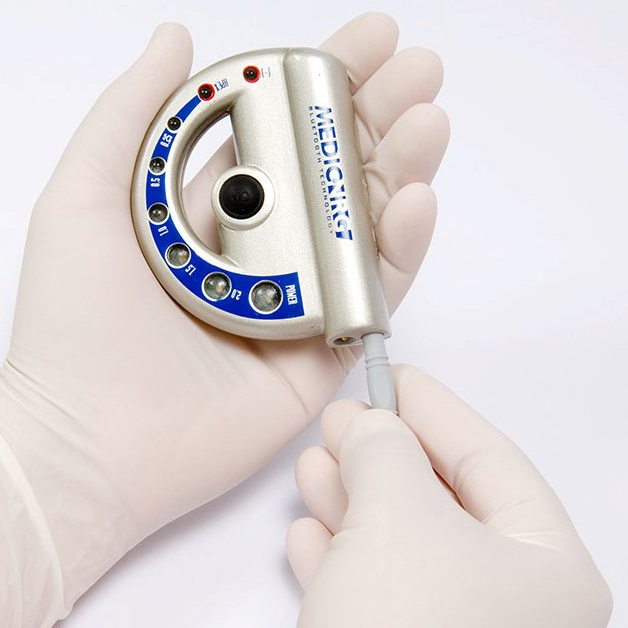 Accurate location of the apical constriction in changing canal conditions, including dry, wet and bleeding canals, through unique automatic adjustment of measuring current. Accuracy within 0.1 mm in the apical region. 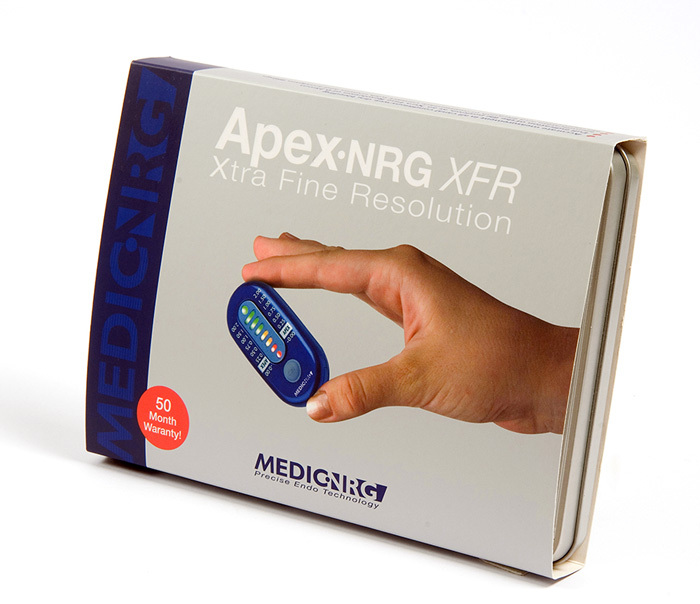 MedicNRG's apex locators automatically calibrate, as opposed to comparable devices which need to be manually recalibrated from time to time. 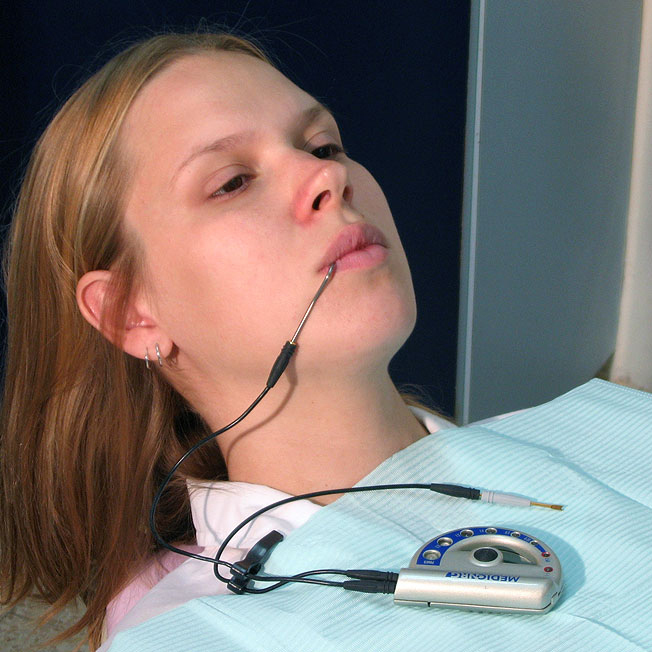 Placement near patient’s mouth, within your line of vision, allowing you to easily and comfortably follow the progress of the file on-line. 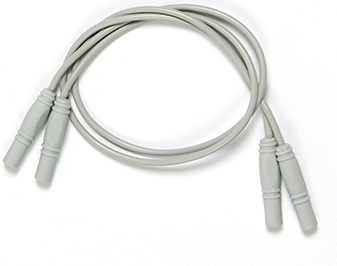 Short cables prevent external EMI distortions that can occur in weak and sensitive signals that are typical of long cables. 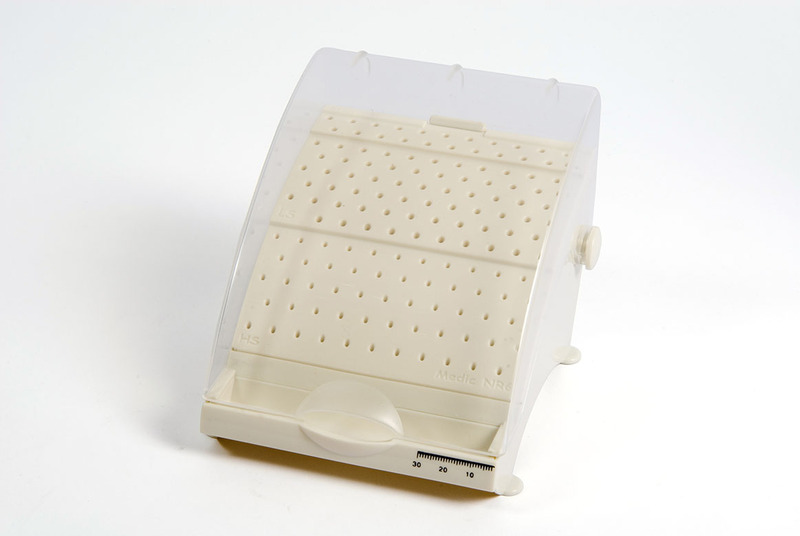 This compact instrument (36 grams) is easy to store and easy to manipulate during treatments. 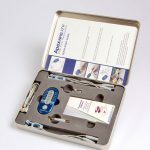 Fully autoclavable accessories including a double set of cables, lip hooks, apron clasps, as well as a sensor probe and exclusive mini file holders. Advanced digital technology based on proprietary firmware decodes the signals returning from the root canal as a result of the electric stimulus sent towards the apical constriction. 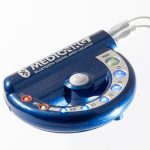 MedicNRG's proprietary algorithm continuously translates the data received via micro-electrical signals, refreshing the display constantly so that each minute movement of the file is read on-line. The specially designed warning system prevents the registration of inaccurate information that might impair treatment increasing the XFR's reliability. 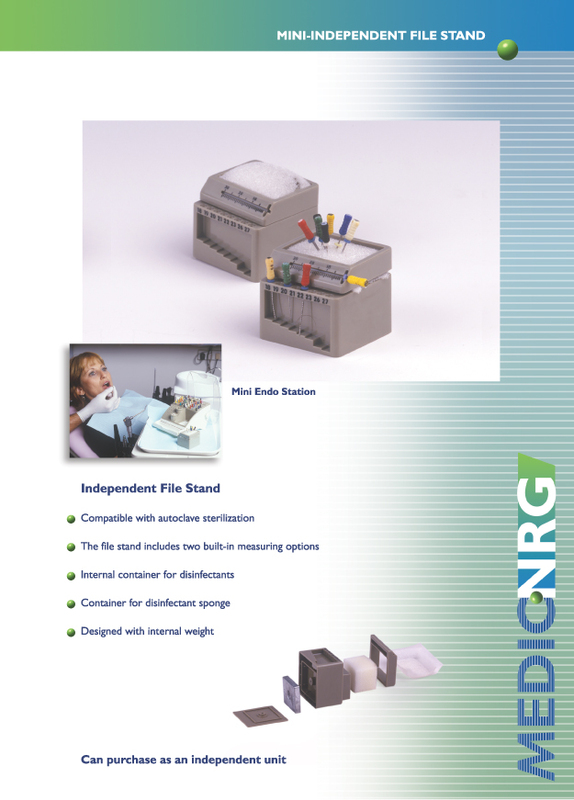 Removable “Endo Cube” for measuring and disinfecting files. 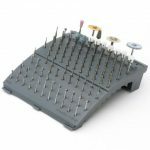 The panoramic shape of the device allows for a clear view and easy access to each tool. 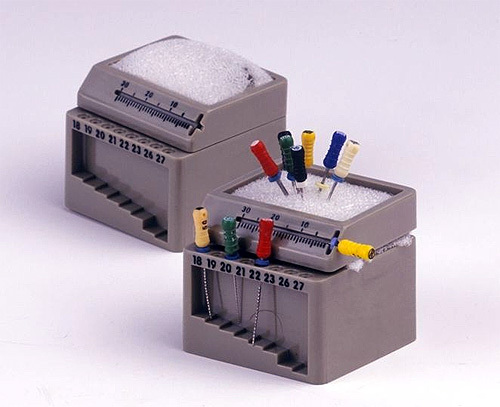 Both the tool tray and the “Endo Cube” are suitable for sterilization in the autoclave. 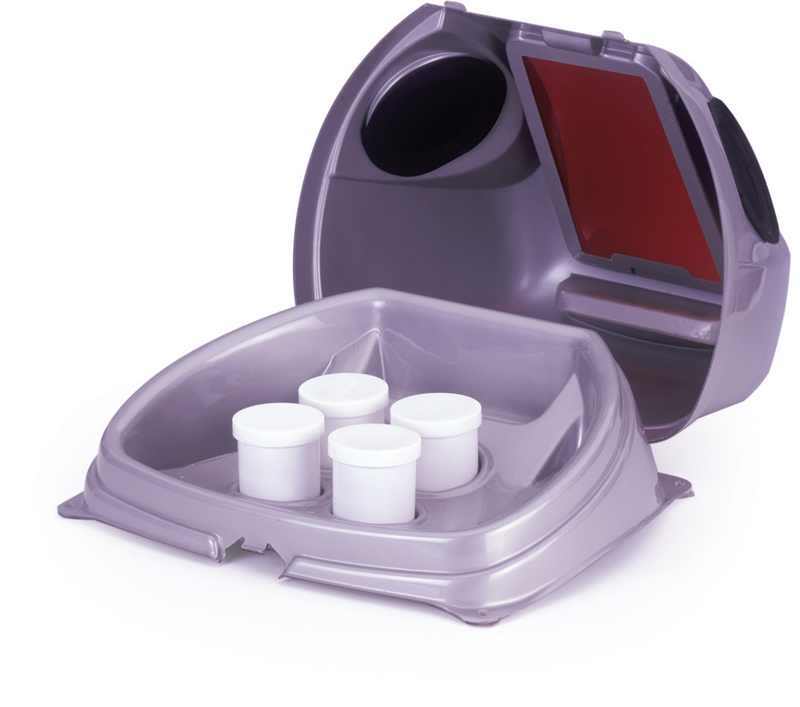 In addition, there are designated reservoirs for disinfectant fluids and cotton pellets. 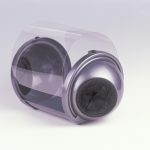 This, combined with the detachable clear cover helps prevents cross contamination and protects tools. 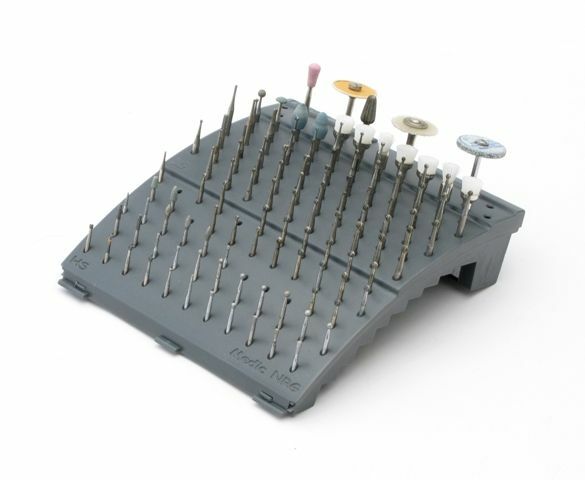 The tray is clearly marked and separated into areas designated for the various Endodontic tools necessary for performing Endo procedures: Gates, Spreaders, Engine Files, Head Storm Files, Burrs, etc. In addition, the organizer includes a convenient accessory drawer with adjustable compartments for clamps, dams, etc. The patented cradle and open back design allow drainage and ventilation of the tool shafts, which speed up drying time and prevents corrosion. 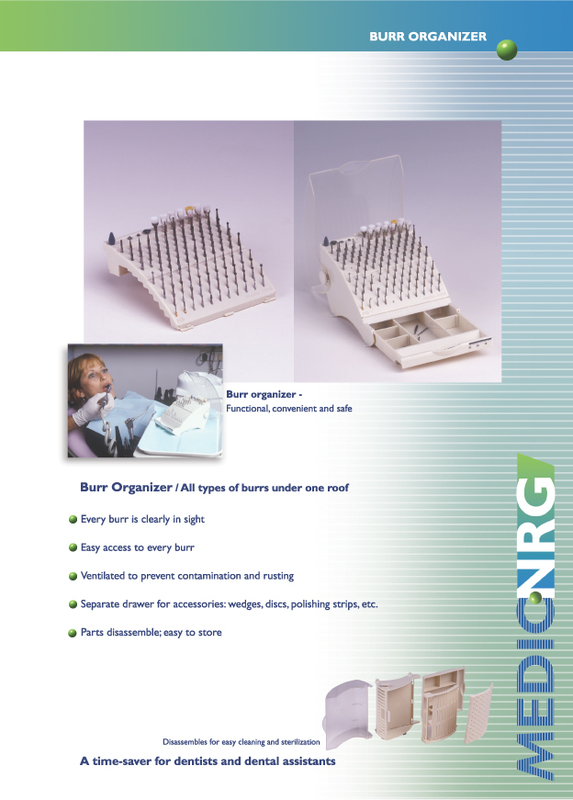 The organizer is easily dismantled. Parts may be cleaned individually. 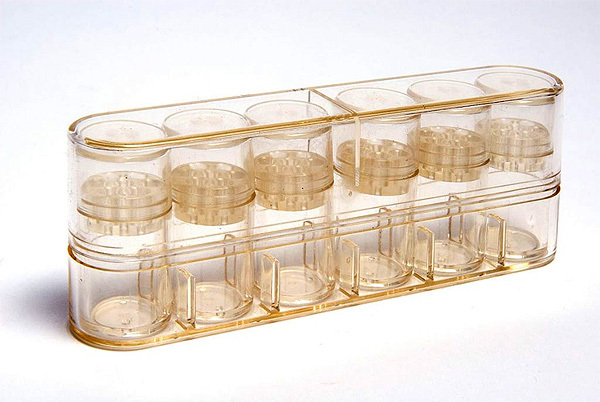 Improved sterility – the cube is suitable for autoclave sterilization! 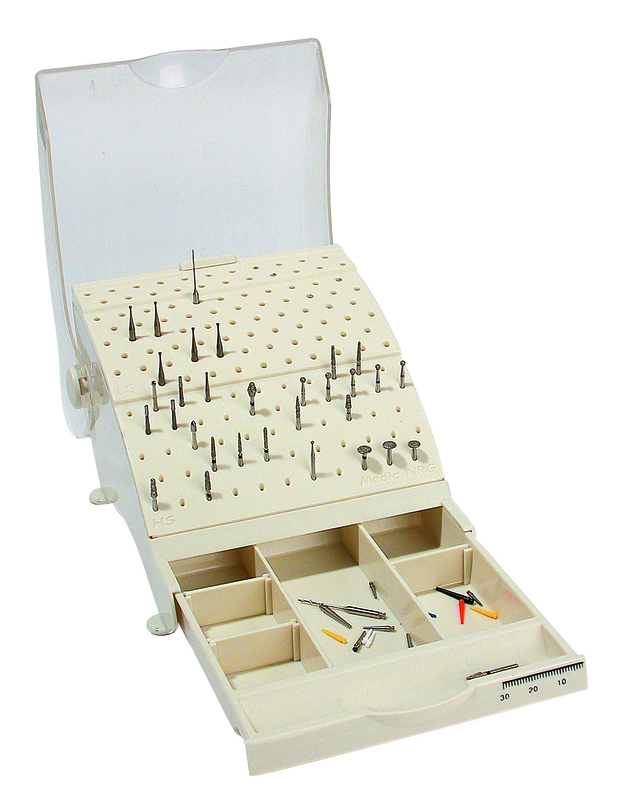 The file stand includes two measuring options. 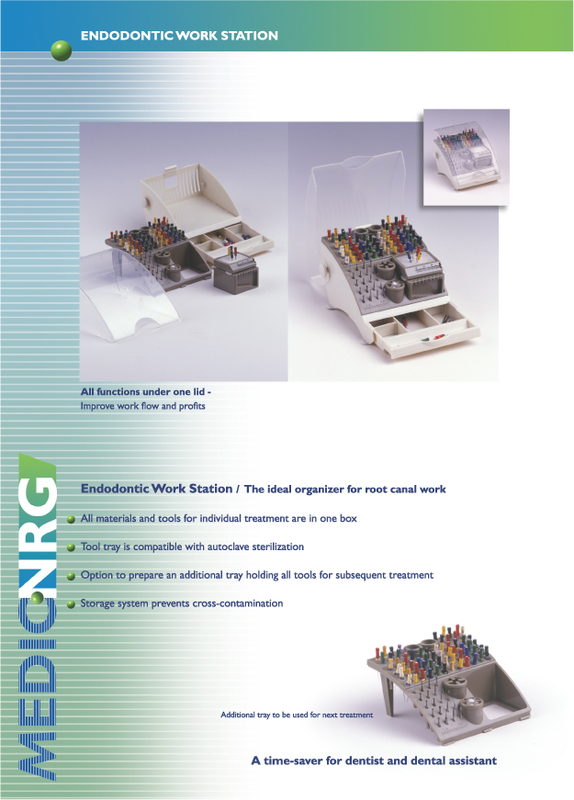 Can be used with the Endo Workstation or as an independent unit. 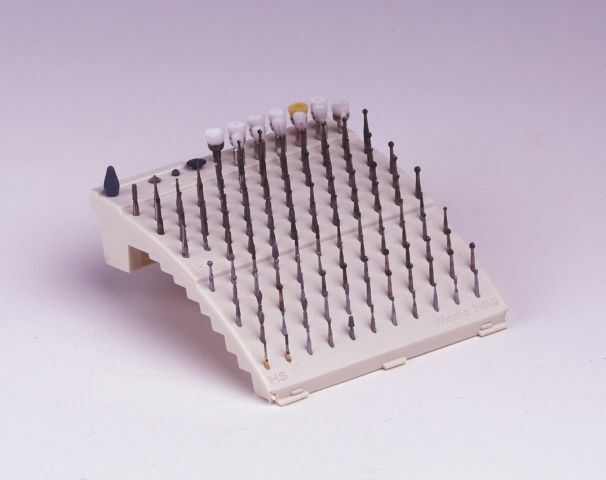 Improved sterility – the organizer is suitable for autoclave sterilization! 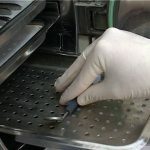 Sterilize an additional set simultaneously in preparation for the next procedure. Increased efficiency reduces work time. Autoclavable! Sold in 3-paks for your convenience. 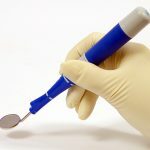 Medical grade stainless steel. Autoclavable! Sold in 3-paks for your convenience. 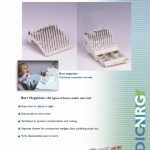 Reusable – the mini file holder is suitable for autoclave sterilization! 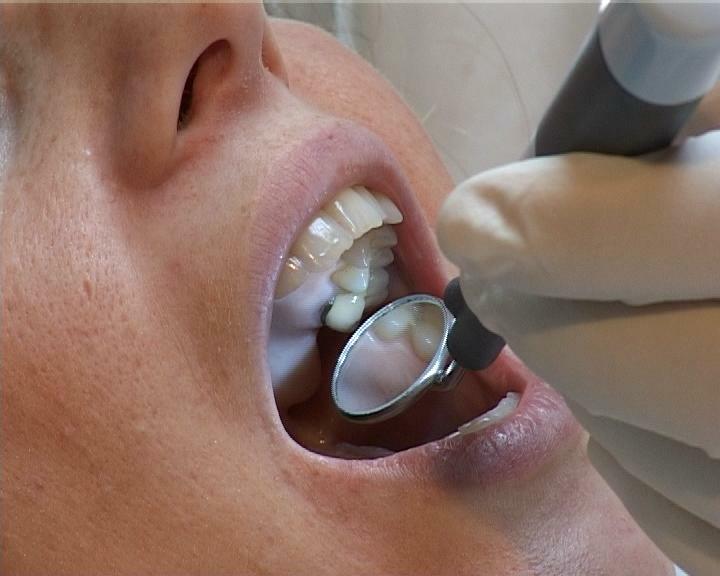 Tiny size maximizes the limited space inside the oral cavity. 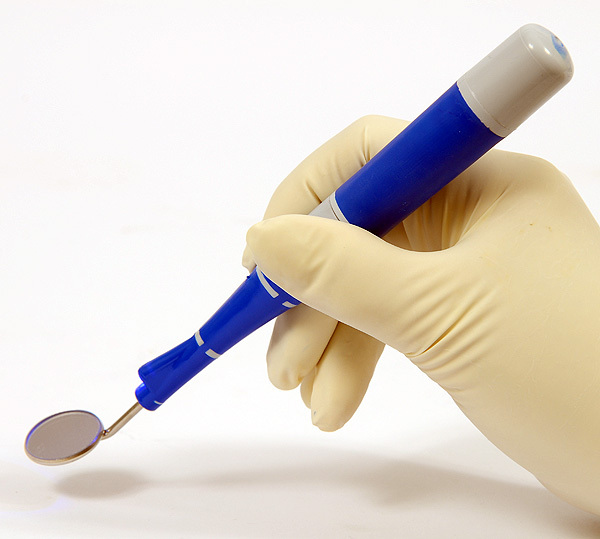 Convenient – especially helpful when working on the molar teeth. Sold in 3-paks for your convenience. 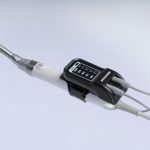 Autoclave Safe – the sensor probe is suitable for autoclave sterilization! 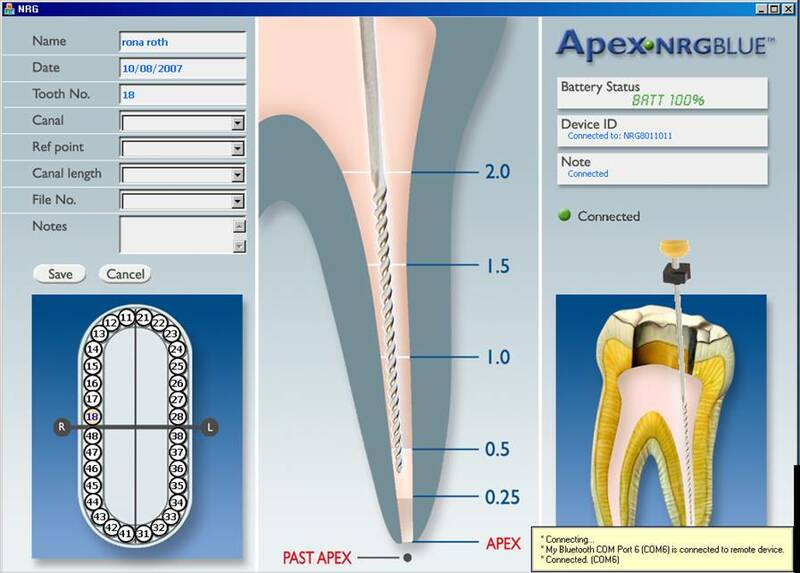 Reliable – the location of the file will be shown on the apex locator immediately upon making contact with the file. Allows you to check file’s location intermittently, at intervals of your choice. 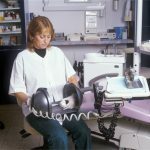 Increased efficiency Contact should be made increasingly often when approaching the biological apex, in order to prevent perforation. 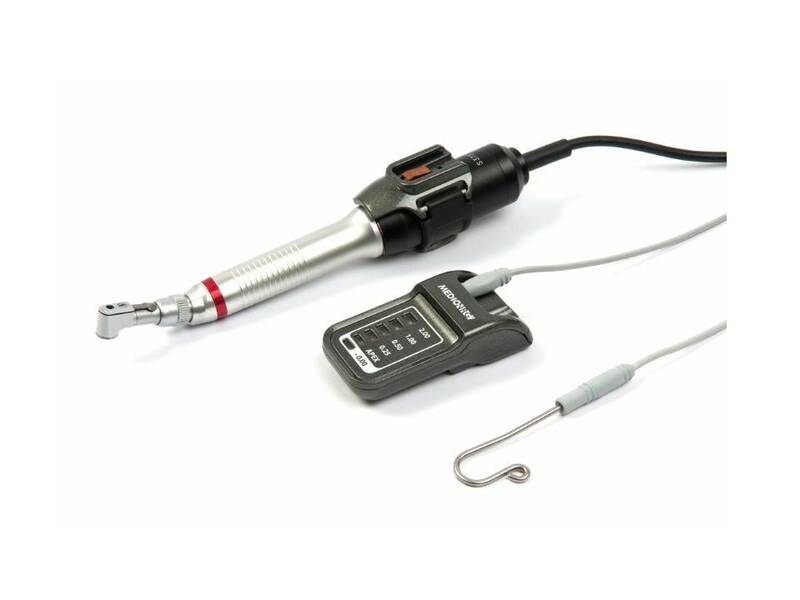 The location of the file will be shown on the apex locator only during direct contact with the sensor probe. 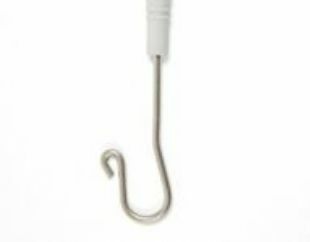 Autoclave Safe – the mini sensor probe is suitable for autoclave sterilization! 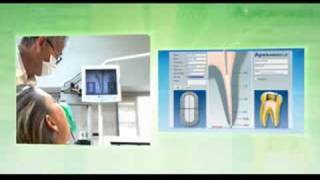 Maximizes the limited space inside the oral cavity. Contact should be made increasingly often when approaching the biological apex, in order to prevent perforation. 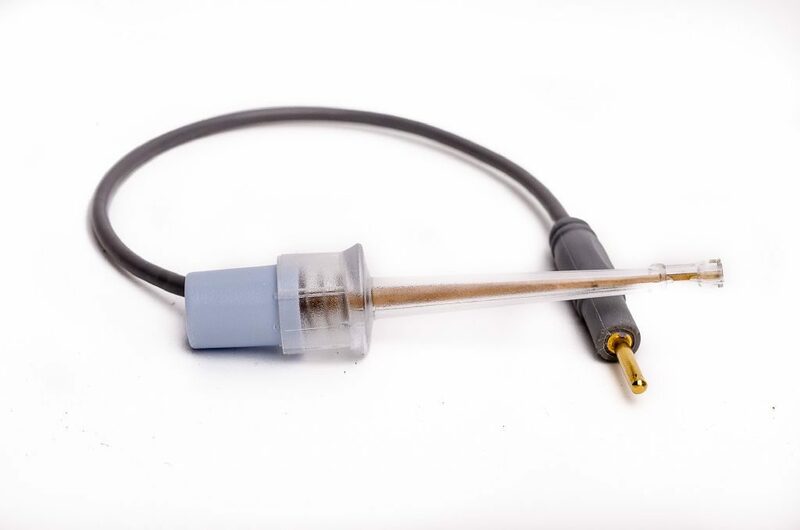 The location of the file will be shown on the apex locator only during direct contact with the sensor probe. Keeps the EAL clean and dry during the procedure. 20 sleeves in each packet. 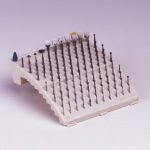 Non-skid pads Cross Contamination Avoidance The removable tool tray is suitable for sterilization in the autoclave. 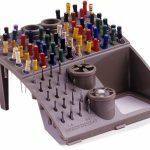 This, combined with the detachable clear cover helps prevents cross contamination and protects tools. 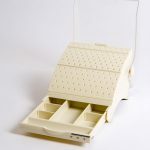 Non-skid pads Cross Contamination Avoidance The tool tray is easily dismantled for disinfection and cleaning. 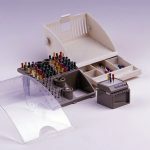 This, combined with the detachable clear cover helps prevents cross contamination and protects tools. 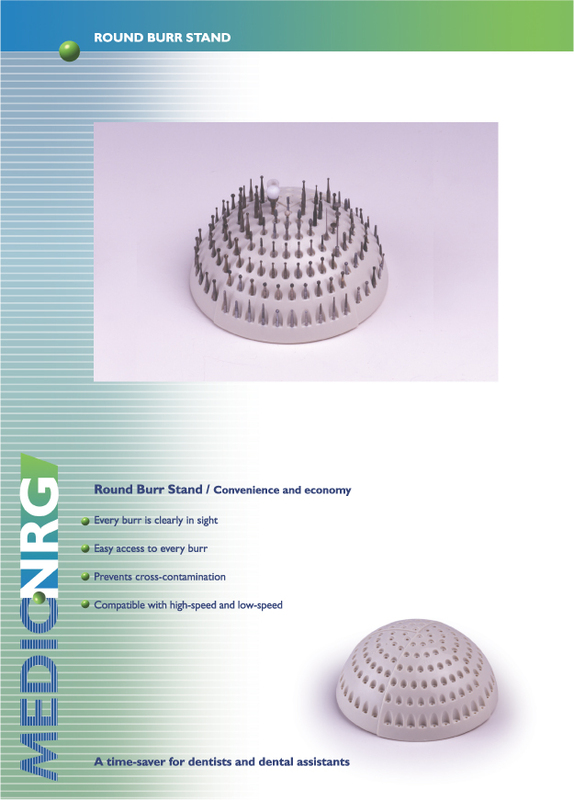 Compatible with both high-speed and low-speed burrs. 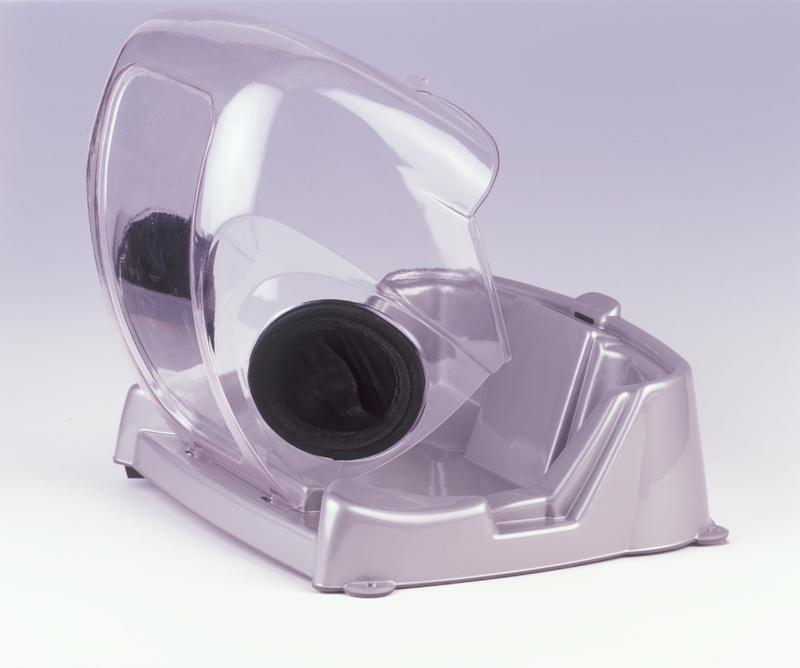 Both you and your patient are protected from dust and fragments. 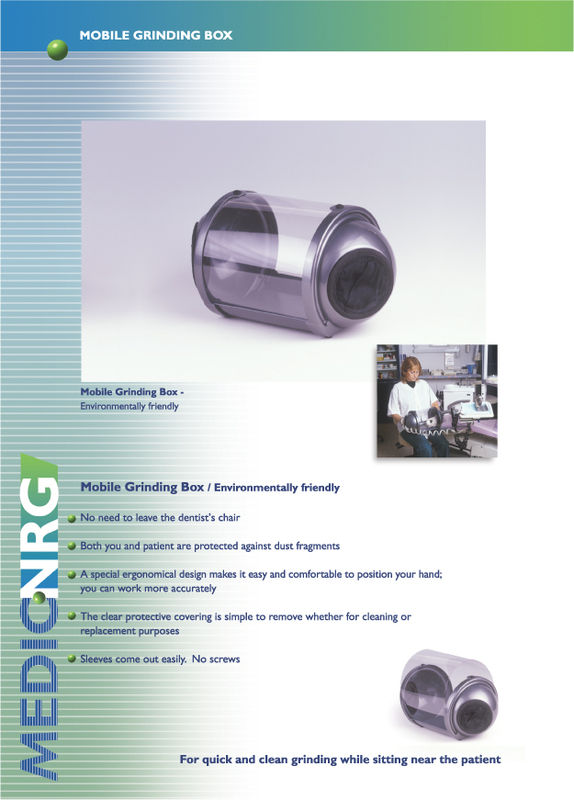 A special ergonomical design makes it easy and comfortable to position your hand; you can work more accurately. 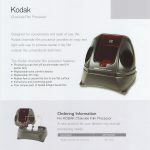 The clear protective covering is simple to remove for cleaning or replacement. Sleeves are readily detachable; no screws. No need to leave your chair! 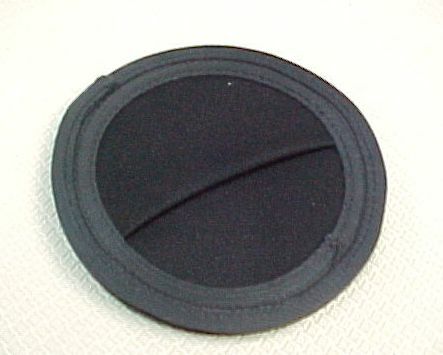 Sleeves are readily detachable for easy replacement. 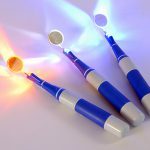 Introducing a new level of bright light inside the oral cavity and provides dental professionals with a whole new level of comfort. Brilliant Light: The simplicity of the device is brilliant, literally and metaphorically. 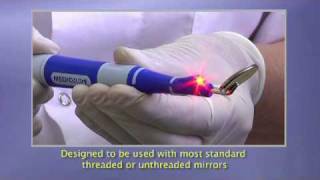 The bright LED light introduces a new level of light into the dark oral cavity, giving the dental professionals a whole new level of comfort. 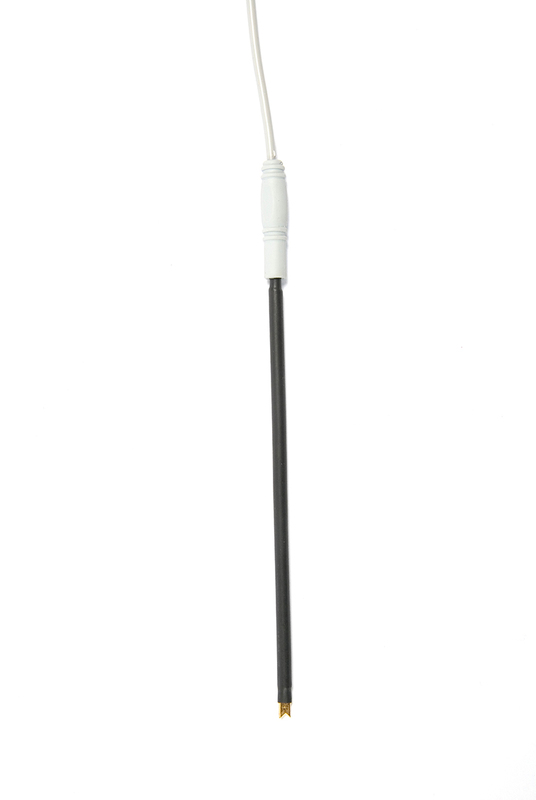 A bright, focused and miniature light which can reduce the need to use the bulky overhead lights. 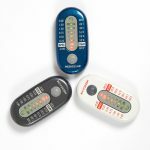 Multiple Functions: The LumiNRG can perform different functions, by using the different colored LEDs that can be interchanged. 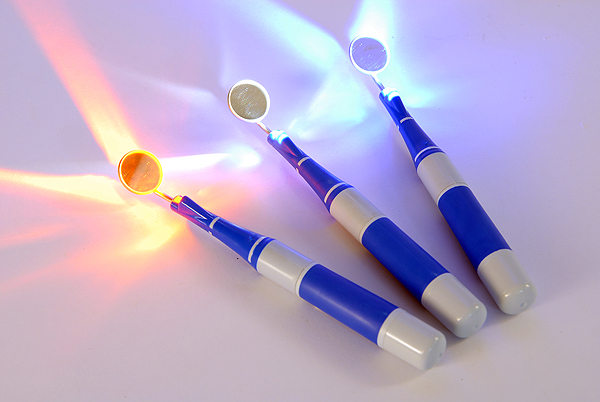 In order to diagnose external cracks in the tooth, attach the Blue LED. 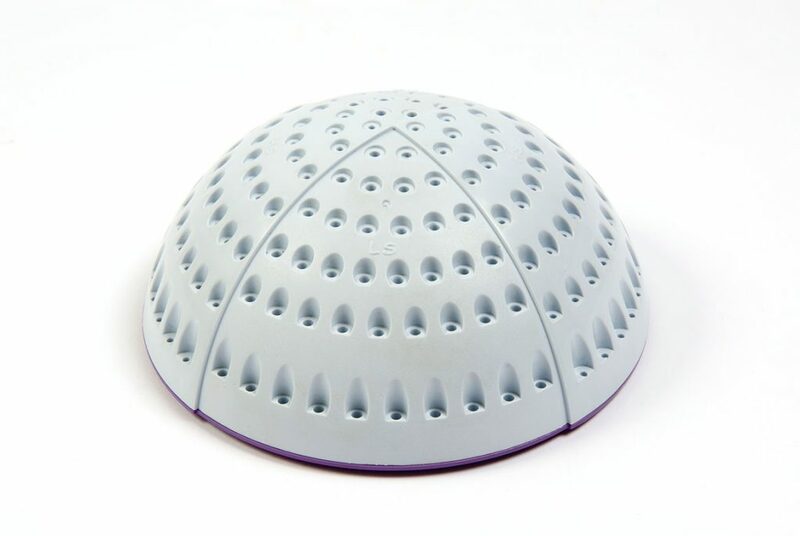 The bright white LED or the orange LED can support curing processes. The white LED for faster curing, the orange LED for slower curing. 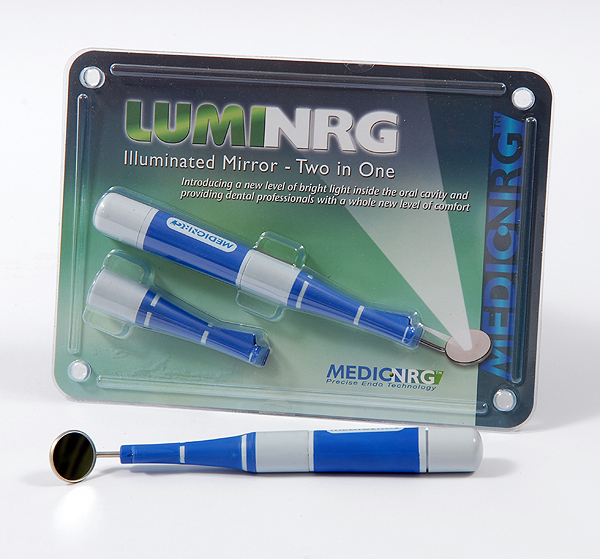 Adaptable: LumiNRG is designed to be used with standard threaded or unthreaded mirrors. 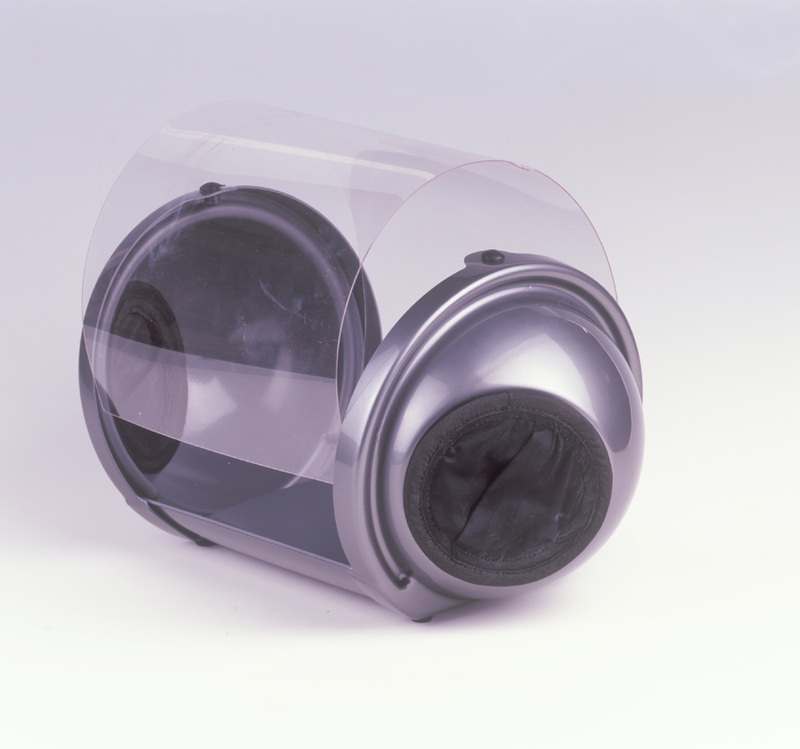 Based on a new patent which enables the adjustment of the mirror to any angle or depth from the light. 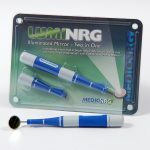 Versatile: In addition to use with standard mirrors, the LumiNRG can also be used with many different tips and instruments, providing they are of a standard 3 mm threaded diameter. 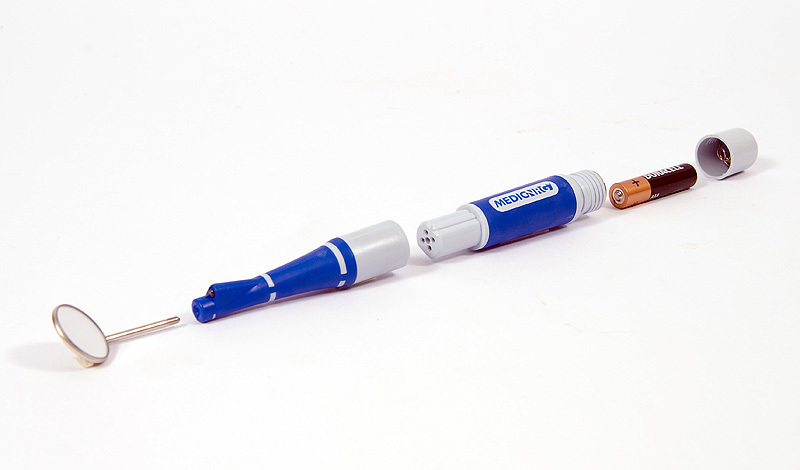 Scalers, pluggers and other tips can easily be attached to the LumiNRG. The desired instrument's angle can be adjusted for optimizing the light source. Autoclavable! 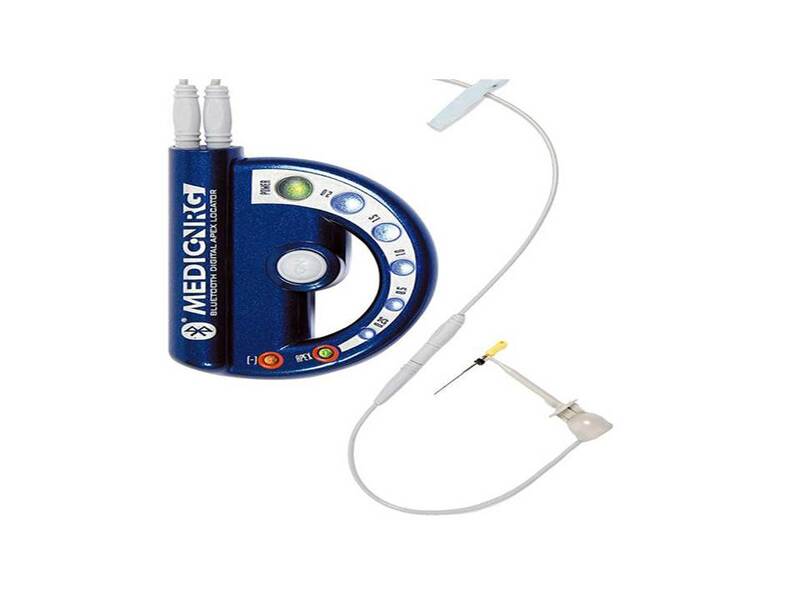 The LumiNRG's illumination head can be placed directly into the autoclave along with the other dental tools.. 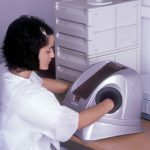 There is no need to detach the mirror or other instrument prior to sterilization. The battery pack must be detached. 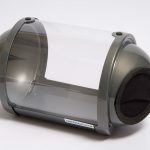 Hands Free: Say goodbye to the bulky and inconvenient overhead light. 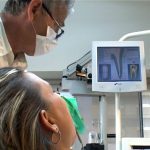 No longer will dental professionals have to adjust and re-adjust the large overhead light during the procedure. 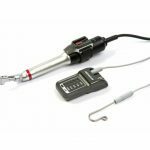 Minimal Size: The LumiNRG ensures that virtually no extra space will be taken up in the already limited space of the oral cavity and is especially helpful when working on the remote molar teeth. 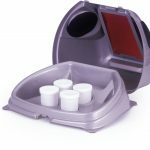 Panoramic, autoclave safe tray for burrs and drills. 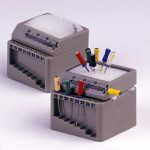 Fits both D001-1 and D001-1 atc models. 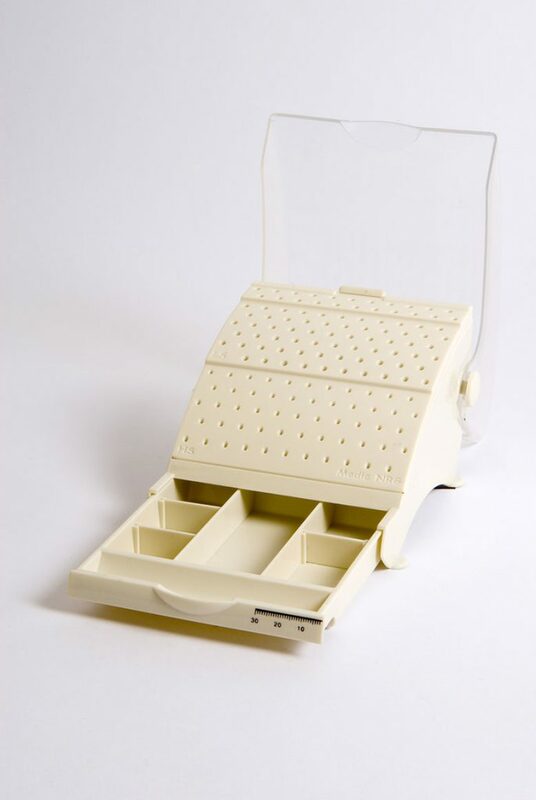 Remove the tray from the organizer by gently pushing back the tab at the top of the tray. 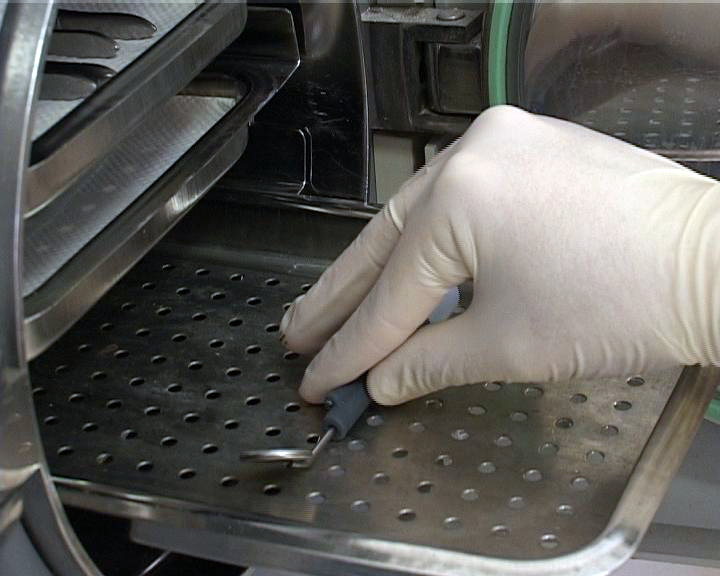 Place the tray, including the burrs, into the autoclave. Run the autoclave according to manufacturer's preset cycles (134 ºC for 5 minutes or 121 ºC for 20 minutes). 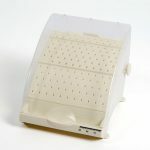 After the completion of the sterilization cycle, return the tray to the organizer. 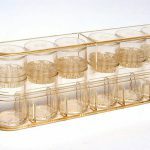 Make sure to secure the tray under the tab at rear of the organizer. 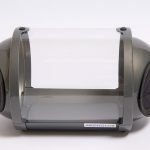 Close the protective cover to help prevent cross-contamination. Easy to replace cover for simple maintenance. Improved ergonomics with a special hand support for your added comfort. 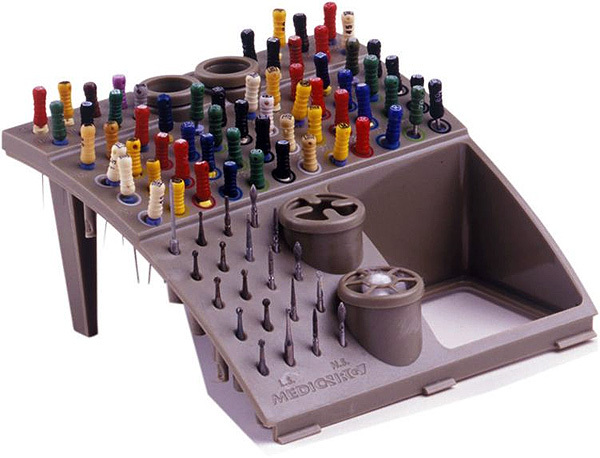 Prevents overburdening of muscles and improves accuracy of work. Large internal work space for easy grinding and sharpening. Easy to remove cover for simple maintenance. Double layered to ensure optimal developing results. 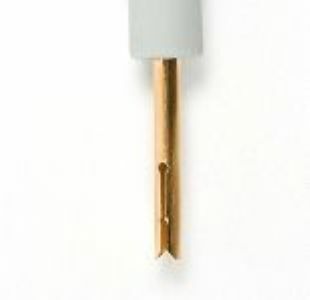 Easily replaced when damaged by developing chemicals. Easily replaced; Available in extra thick width. 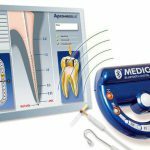 MedicNRG was founded in order to supply high quality instruments and aids to dentists, allowing them to optimize their dental procedures. 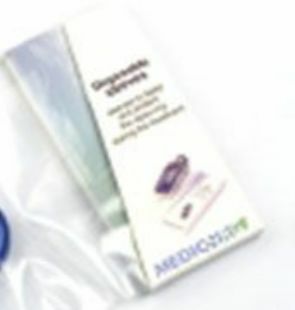 The management of MedicNRG places high importance on the quality of the products supplied by us. 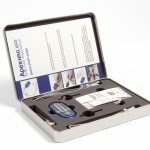 In order for us to ensure the quality of our products, MedicNRG has implemented a strict quality system that dictates all of the different stages of the design, production and distribution of our devices. 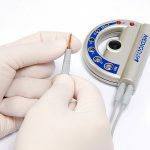 Our quality procedures enable us to meet the requirements of the European and US laws demonstrated in the CE MDD and the US FDA. In 2007, we also acheived formal ISO certification for both international standards: ISO 9001:2008 and ISO 13485:2003, including the special requirements for Health Canada. 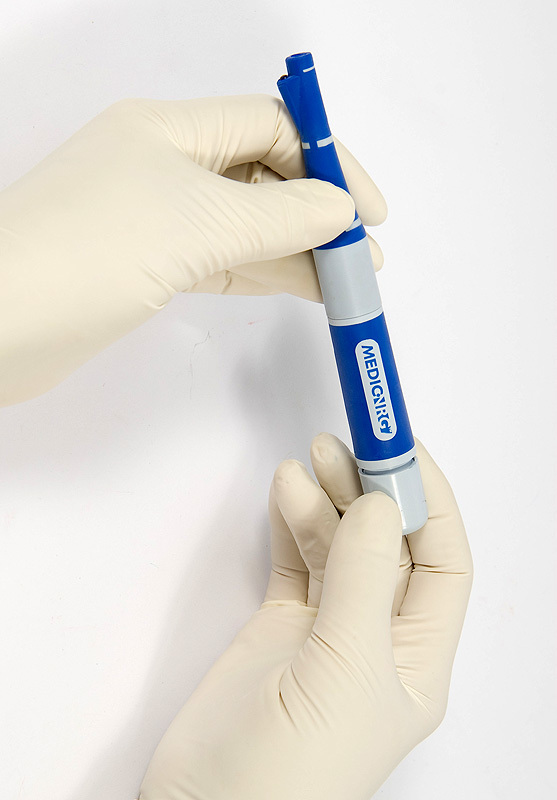 In addition, MedicNRG’s management is committed to the full implementation of all of the procedures in order to ensure a consistent level of quality, while striving to always improve all our processes. 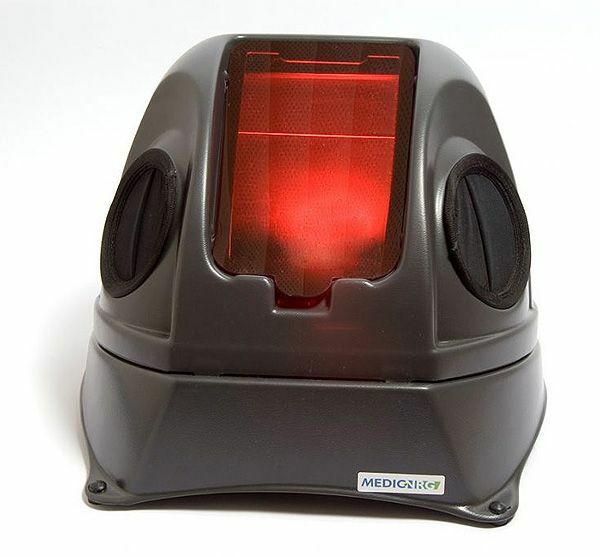 ELECTRONIC APEX LOCATOR INTEGRATED WITH BLUETOOTH WIRELESS TECHNOLOGY . 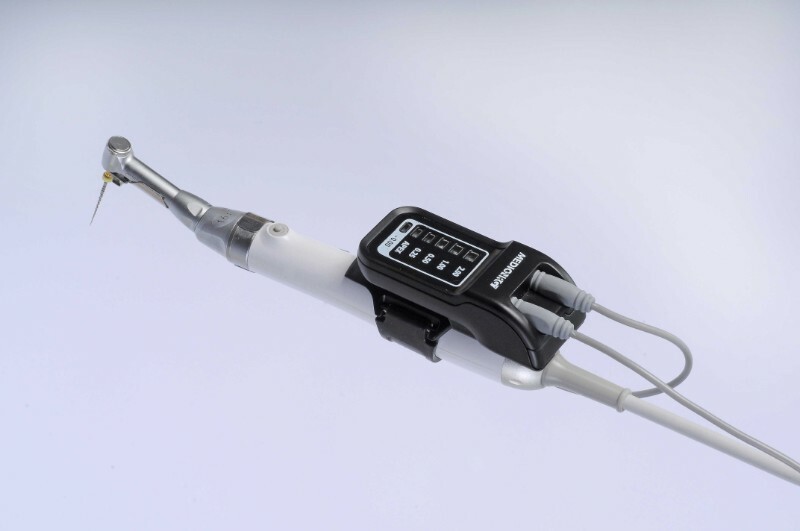 Prof. Ivanovic presented the results of a comparative study that compared different methods and different devices for measuring the canal working length by locating apical constriction. 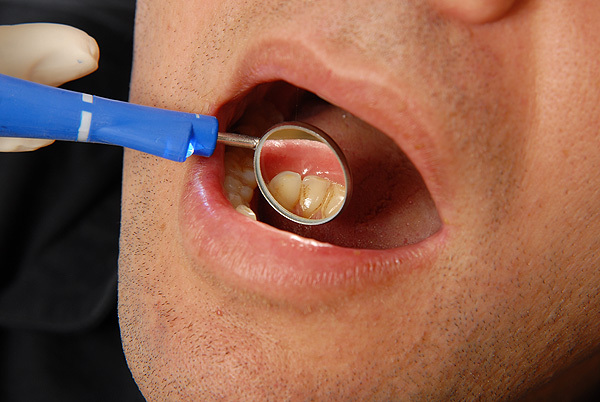 The study was performed by first measuring the length of teeth destined for extraction (in vivo) and finished by measuring the location of the file in the extracted tooth.